Please do put some time aside to enjoy these 3 wonderful, short films that comprise ‘Echo-Maker’ by Sean Harris. Floods on the Somerset Levels gave scientists a rare chance to study the effect of extreme weather on wildlife. BABY CRANE UPDATE - Well some sad news to report this morning. Our Crane chick on the Rushy has not made it. Let's hope they do better next year. Initial post mortem results on the baby Crane show underlying lung & kidney disease were the cause of death. 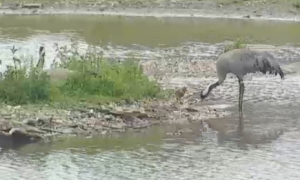 WWT Slimbridge confirmed that they have a crane chick! One of the team photographed it this morning and they are waiting to confirm but based on second hand information it looks like it could be 24-36 hours old. Keep watching for the second chick it is addictive viewing!